Free cash flow, or owner earnings as Warren Buffet likes to call it, is a measure of the company’s ability to generate cash over a period of time. We like to say it is the money an owner could take out of his business and spend for his own benefit. Free cash flow is an important measure because it allows for the continuing capital expenditures that will be necessary to maintain a healthy business. Profit and even operating cash flow measures do not. Sign up for our online financial statement training and get the statement of cash flows training you need. The cash flow statement allows you to calculate free cash flow, calculated below using our sample cash flow statement. Amounts shown in thousands. 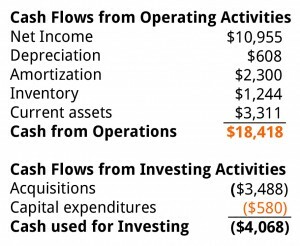 Free cash flow is calculated by taking Net cash flow from operating activities, $18,418, and subtracting capital expenditures, $580. These figures come directly from the cash flow statement. Net capital expenditures are purchases of property, plant, and equipment – a line item in the investing section of the cash flow statement. We use the term net capital expenditures because many businesses add back any proceeds from sales of capital equipment (another line in the investing section). Note that net capital expenditures is almost always a negative number, which may create some confusion. Ignore the minus sign! Investors have gravitated to this metric because cash is not subject to estimates and assumptions. It’s easy to audit cash balances. Unless the company is simply lying – and this kind of lie is very likely to come out quickly – it really has the cash flow indicated on its statement.